Led by scientists at the Department of Energy's SLAC National Accelerator Laboratory and Stanford University, the team made these observations by measuring tiny bursts of electromagnetic waves given off by the traveling electrons – a phenomenon described more than a century ago by Maxwell's equations, but only now applied to this important measurement. "To make something useful, generally you need to put different materials together and transfer charge or heat or light between them," said Eric Yue Ma, a postdoctoral researcher in the laboratory of SLAC/Stanford Professor Tony Heinz and lead author of a report in Science Advances. "This opens up a new way to measure how charge – in this case, electrons and holes – travels across the abrupt interface between two materials," he said. "It doesn't just apply to layered materials. For instance, it can also be used to look at electrons flowing between a solid surface and molecules that are attached to it, or even, in principle, between a liquid and a solid." The materials used in this experiment are transition metal dichalcogenides, or TMDCs – an emerging class of semiconducting materials that consist of layers just a few atoms thick. 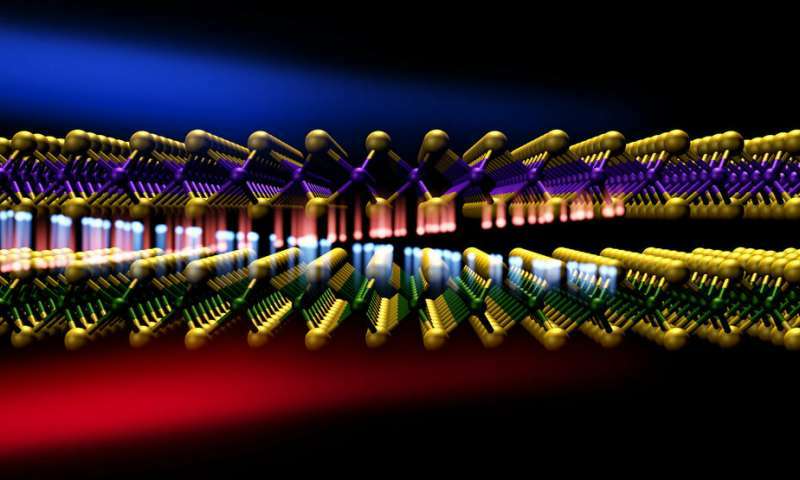 There's been an explosion of interest in TMDCs over the past few years as scientists explore their fundamental properties and potential uses in nanoelectronics and photonics. But until now, researchers who wanted to observe and study that flow had only been able to do it indirectly, by probing the material before and after the electrons had moved. The distances involved were just too short, and the electron speeds too fast, for today's instruments to catch the flow of charge directly. At least that's what they thought. According to a famous set of equations named after physicist James Clerk Maxwell, pulses of current give off electromagnetic waves, which can vary from radio waves and microwaves to visible light and X-rays. In this case, the team realized that an electron's journey from one TMDC layer to another should generate blips of terahertz waves – which fall between microwaves and infrared light on the electromagnetic spectrum – and that those blips could be detected with today's state-of-the-art tools. "People had probably thought of this before, but dismissed the idea because they thought there was no way you could measure the current from electrons traveling such a small distance in such a small amount of material," Ma said. "But if you do a back-of-the-envelope calculation, you see that if a current is really that fast you should be able to measure the emitted light, so we just tried." "With the demonstration of this new technique, many exciting problems can now be addressed," said Heinz, who led the team's investigation. "For example, rotating one of the two crystal layers with respect to the other is known to dramatically change the electronic and optical properties of the combined layers. This method will allow us to directly follow the rapid motion of electrons from one layer to the other and see how this motion is affected by the relative positioning of the atoms."